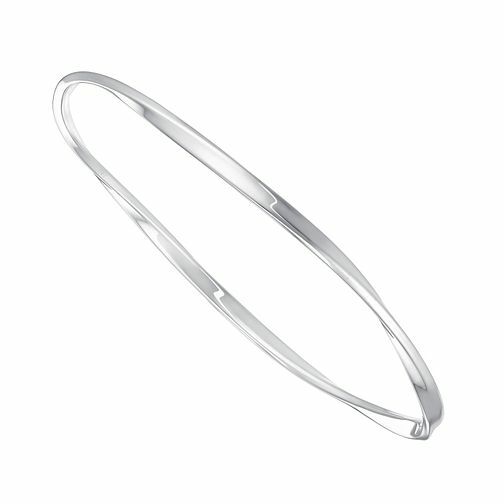 Simple and effortlessly chic, this elegant bangle is a must have addition to any jewellery collection. Crafted from sleek sterling silver, this beautiful bangle features a delicate twist design making it perfect for everyday wear. Sterling Silver Twist Bangle is rated 4.9 out of 5 by 11. Rated 5 out of 5 by Anonymous from Bought as a birthday gift and would buy for myself. Bought the bangle for a friend who doesn't wear alot of jewellery. She absolutely loved it. It's simple but beautiful and very elegant. I have hinted to my husband that I would love one as a gift. Rated 4 out of 5 by Anonymous from Lovely item. Perfect for a gift. This bracelet was a present for my mums 50th birthday. She loves it and it is the perfect accessory to go with any outfit.